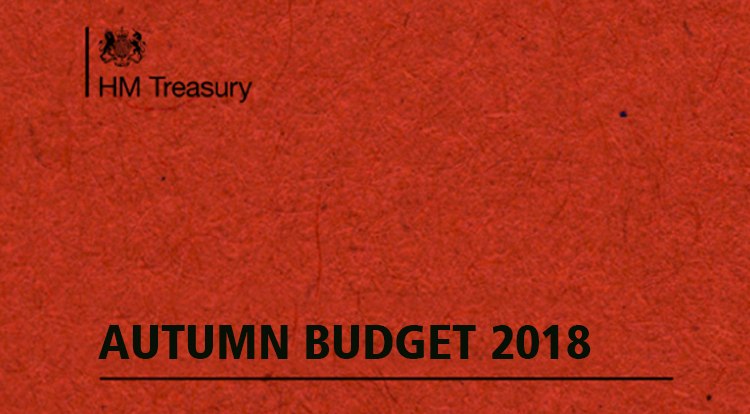 Chancellor Phillip Hammond has presented the latest Budget to Parliament on 29 October: a review of the UK’s finances and economic forecasts. Here is our overview of the key points of the Budget 2018. The Office for Budget Responsibility (OBR) revised GDP growth in 2018 down from 1.5 to 1.3 per cent. Thereafter they expect growth to be resilient and now forecasts UK GDP growth of 1.6 per cent in 2019, slowing at 1.4 per cent in 2020, and picking up to 1.5 in 2022 and back to 1.6 per cent in 2023. Additional funding through to 2020-21 was announced for the devolved administrations; seeing £950 million for the Scottish Government, £550 million for the Welsh Government, and £320 million for a Northern Ireland Executive. Small retail businesses will see their business rates bills cut by a third for two years from April 2019, saving them £900 million. This adds to previous reductions in business rates since Budget 2016 which will save firms over £12 billion over the next five years. From April, large businesses will be able to invest up to 25 per cent of their apprenticeship levy to support apprentices in their supply chain. This means some employers will pay half of what they currently pay for apprenticeship training. There will be a new two per cent digital services tax on UK revenues of big technology companies from April 2020. The Chancellor said “established tech giants” will be targeted and emphasised that start-ups will be protected from the levy. Ahead of the Budget, British Chambers of Commerce called for bold incentives to turbo charge business investment and Phillip Hammond appears to have listened to these calls by boosting the Annual Investment Allowance from £200,000 to £1m for two years. The Chancellor did not focus on Brexit in his speech, but the government is providing £500 million of additional funding for departments to prepare for Brexit for 2019-20. This is on top of the £1.5 billion already announced for that year. A commemorative 50p coin was also announced to mark the UK’s departure from the EU. In the current circumstances, the OBR stated that assumptions will be adjusted as necessary for the eventual agreements on trade, migration and budget contributions. The current forecast has been made assuming a relatively smooth exit from the EU. The 2018 Budget also outlined plans to invest £400 million extra in schools, £650 million for social care and NHS funding will increase its budget by £20.5 billion after inflation by 2023-24 including an increase in mental health spending. From April 2019 the National Living Wage will increase from £7.83 an hour to £8.21 and tax-free Personal Allowance will rise to £12,500. You can read a summary of the key announcements here. Read the 2018 Budget in full here.